Welcome to June’s article on the use of advanced ball control skills! It’s 2018 which means it’s a World Cup year and the excitement is ramping up. We often get asked what types of services Soccer in Slow Motion provides and one of the most exciting ones is event entertainment. This summer we will be sharing our skills across the US for a variety of World Cup viewing parties from Los Angeles to New York. Not only do our players concentrate on their finer ball control skills, but they are acquiring a skill set that allows them to perform on behalf of major companies, travel across the US, and share their skills with soccer fans from all over. Several of our players will be performing at World Cup viewing parties in Los Angeles, San Francisco, and New York. We will also be joining Adobe, Inc. for a fitness day for the employees, running a street soccer competition on June 30th in San Jose for Telemundo, and several others! Performing looks a little like the video below which included samba dancers during the 2014 World Cup, signing autographs, performing on stage for live television programs, etc. During the 2014 World Cup we performed at six of the top night clubs across the United States. Check out the video below and see how our players are using their skills to enjoy the sport to the fullest. So what’s it like to “perform” and what are the benefits? Performances require that our players refine their skills in order to perform without mistakes on stage, or to develop their “vocabulary” of skills to be able to display a wide range of ball control skills while challenging participants. 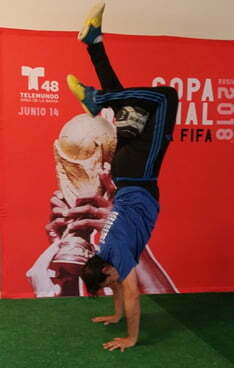 In soccer we often practice a single move and feel accomplished at having learned it. However, when it comes to street soccer, freestyle, and performances you’re now required to perfect your skills (as best possible, even the pros makes errors). The result is a player with more refined skills and a higher level of confidence due to the high level of competency required to perform. Recently, Alejandra from the Bay Area was selected as a “soccer influencer” by Coca-Cola and will be traveling to Russia! She will be on field for the pregame ceremony when Mexico takes on Sweden on June 27th. 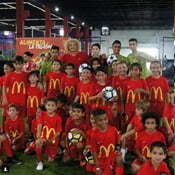 Young Jaedyn, a SISM player and top futsal player from Dallas, has had the chance to perform with us and represent McDonald’s on multiple tours. She’d showed many young guys that girls have quite the talent! 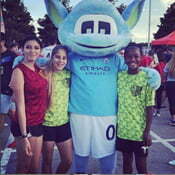 Also in the center photo is the United States’ top female street soccer player and 2x panna champion, Alexis Mata (center photo in red jersey). Alexis is our most seasoned performer and has performed and competed around the world for many of the top companies! 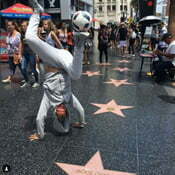 Young Leo traveled to Los Angeles with our SISM team and had the chance to share his skills as he competed against on the of the world’s top street players who was visiting from Belgium! So not only does the development of skills benefit players in their soccer matches, but it opens up opportunities than many would never have imagined! So keep an eye on our SISM social media pages as we continue on our journey of training using the Dewazien 9-step routine to build new young stars who will work their way to performing with their refined skills!